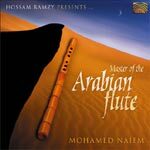 If the sunset over the Nile’s golden water could be transcribed into sound it will be the magic that Mohamed Naiem (who counts among the best Egyptian Nay and Kawala players) brings to us through this new collaboration (Master of the Arabian Flute) with Egypt’s Ambassador of Rhythm, Hossam Ramzy. This album also features the amazing keyboard player, Osama Al Hendy, one of Hossam’s protges and world-renowned composer and arranger. This album features the three of them, Mohammed, Hossam Osama in an album that was composed in a musical heaven. Soft, haunting melodies that take us on a dreamy journey to the most far-away desert of our darkest dreams and later on to the evergreen oasis in our hearts. 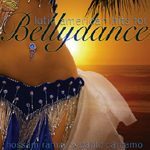 Gentle songs that transform Arabian warm nights under Egyptian lonely skies into magic carpets, on which we can travel to the furthest stars in the long forgotten galaxy of memories. Each tune is an inspiration full of equally clear, digitally recorded and mastered sounds that reach the deepest feelings of the human spirit. Once again Hossam brings us a wonderful world where Nay and Kawala come alive and become the protagonists of fantasies. A beautiful collection of enchanting and fascinating atmospheric music. A perfect gift for the soul. To write a review about this album and share your thoughts with other customers please look at the bottom of the page. A lovely new CD! Especially for those who really enjoy the sweet sound of the nay, accompanied for the best percussion, like always. I was looking for some soft and quite music for dancing and I believe this is the one! The sounds of the desert are outlined in each song adn they will make you dream with open eyes. Misterious some times.. and full of joy after. Songs for the heart. I just wanted to let you know how successful the music has been for my therapies. I went with Arabian Flute and created a compilation by adding some of the more gentle songs from Source of Fire and Secrets of the Eye at the beginning to make it an hour long for treatments. The music is so beautiful and serene that most of my clients are asleep by the end of the treatment, meaning they are really relaxed, which is just the ticket.